1925 - "Millions Now Living Will Never Die!" From 1966 to 1975, the Watchtower regularly implied that Armageddon would arrive in 1975. However, ask one of Jehovah's Witnesses about this date and they will invariably deny there ever being such statements. The following exhaustive list of quotes show the Watchtower left little to the imagination regarding 1975. 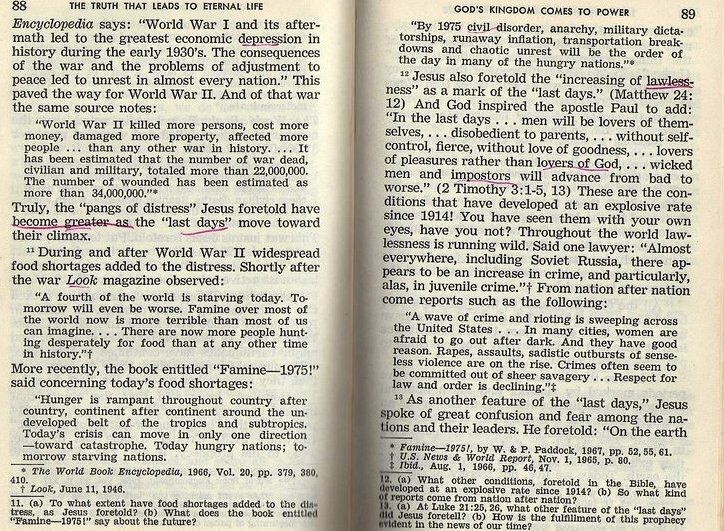 In 1980, the Watchtower made a post-1975 admission that it had encouraged the viewpoint that Jesus earthly rulership would begin 1975. The Watchtower strongly implied the end would come in 1975. The regular implications that 1975 would bring Armageddon resulted in many Jehovah's Witnesses firmly believing this was going to be the end. The growth rate of publishers immediately before and after 1975 shows the significance of this year in Witness minds and the effect of its failure to eventuate. 1976 2,138,537 76,088 4% . There can be no denying the sensational effect of the 1975 teaching when comparing the conversion rate of Bible Studies prior to 1975 with that afterwards. 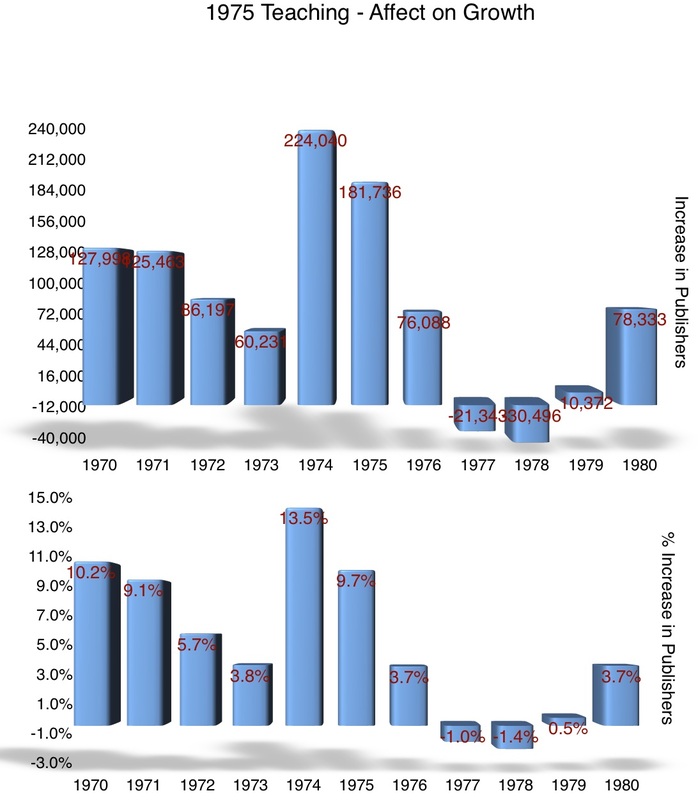 In 1974 a high of over 1 in 5 Bible studies progressed to baptism, compared with just 1 in 30 since the year 2000. The idea that 1975 would witness the end of the world was first introduced in 1966. "Stay Alive to Seventy Five"
"Well now, as Jehovah's Witnesses, as runners, even though some of us have become a little weary, it almost seems as though Jehovah has provided meat in due season. Because he's held up before all of us, a new goal. A new year. Something to reach out for and it just seems it has given all of us so much more energy and power in this final burst of speed to the finish line. And that's the year 1975. Well, we don't have to guess what the year 1975 means if we read the Watchtower. And don't wait 'till 1975. The door is going to be shut before then. As one brother put it, "Stay alive to Seventy-Five""
In November 1968, District Overseer Duggan announced at the Pampa Texas Assembly that "not really a full 83 months remains, so lets be faithful and confident and … we will be alive beyond the war of Armageddon…," which therefore slated Armageddon for October 1975. 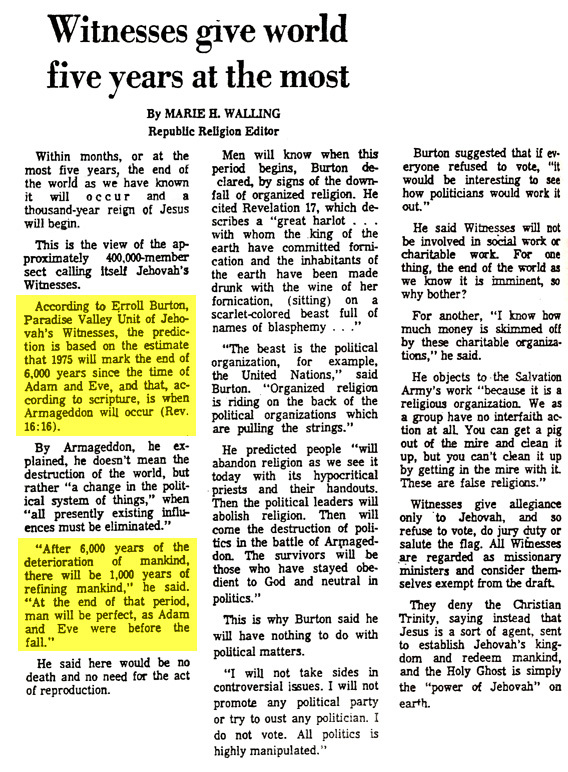 Similar comments flowed through the Watchtower during the late nineteen sixties, showing that the concept Armageddon would arrive in 1975 was encouraged, with terms such as "there is only 6 years left" used as a count down to the end. 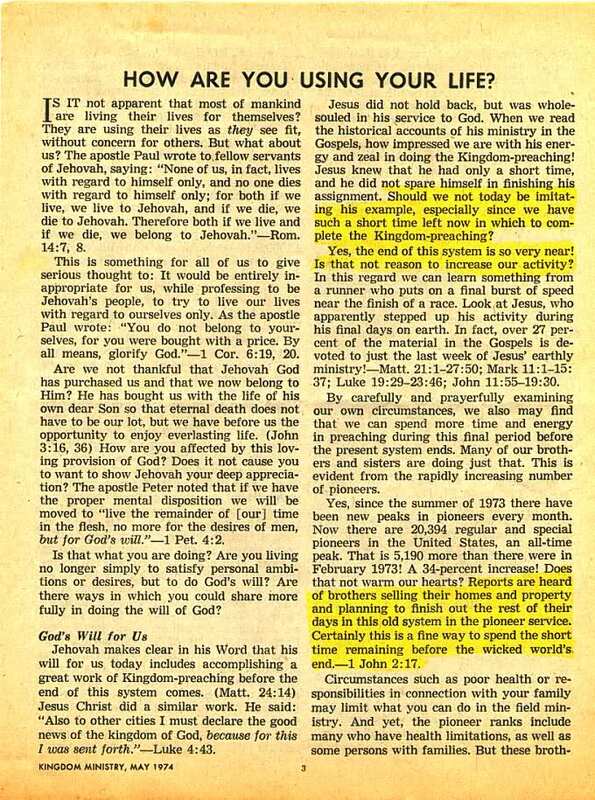 The August 15 issue of the 1968 Watchtower went into great detail to prove that 1975 really is the end of 6000 years, giving credence to 1975 speculation. "WHAT about all this talk concerning the year 1975? Lively discussions, some based on speculation, have burst into flame during recent months among serious students of the Bible. Their interest has been kindled by the belief that 1975 will mark the end of 6,000 years of human history since Adam's creation. The nearness of such an important date indeed fires the imagination and presents unlimited possibilities for discussion. 2 But wait! How do we know their calculations are correct? What basis is there for saying Adam was created nearly 5,993 years ago? Does the one Book that can be implicitly trusted for its truthful historical accuracy, namely, the Inspired Word of Jehovah, the Holy Bible, give support and credence to such a conclusion? 35 One thing is absolutely certain, Bible chronology reinforced with fulfilled Bible prophecy shows that six thousand years of man's existence will soon be up, yes, within this generation! (Matt. 24:34) This is, therefore, no time to be indifferent and complacent. This is not the time to be toying with the words of Jesus that "concerning that day and hour nobody knows , neither the angels of the heavens nor the Son, but only the Father." (Matt. 24:36) To the contrary, it is a time when one should be keenly aware that the end of this system of things is rapidly coming to its violent end. Make no mistake, it is sufficient that the Father himself knows both the "day and hour"! 36 Even if one cannot see beyond 1975, is this any reason to be less active? The apostles could not see even this far; they knew nothing about 1975. All they could see was a short time ahead in which to finish the work assigned to them." 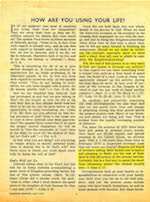 Watchtower 1968 Aug 15 p.494 Why Are You Looking Forward to 1975? In the Awake! 1971 October 8, a timeline was presented with the caption "As we near the end of 6,000 years of human history in the mid-1970's there is the thrilling hope of a grand relief." In the timeline the "Millennial reign of Jesus Christ" starts on the six thousandth year. 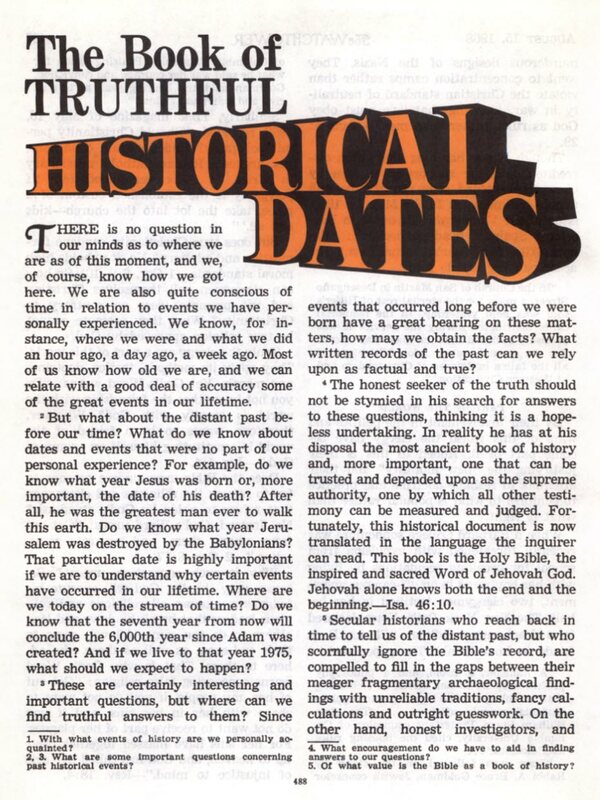 As late as 1975, the Watchtower was still pushing expectation for that year, though with a nice get out clause that it is uncertain how long between the creation of Adam and Eve. "Another speaker, F. W. Franz, the Society’s vice-president, forcefully impressed on the audience the urgency of the Christian preaching work. "… U.S. Secretary of State Dean Acheson said in 1960: "I know enough of what is going on to assure you that, in 15 years from today [or, by 1975], this world is going to be too dangerous to live in." 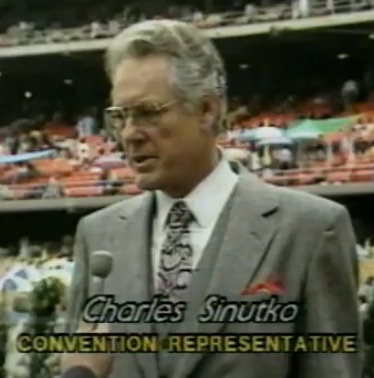 "I forecast a specific date, 1975, when the new crisis will be upon us in all its awesome importance." "By 1975 civil disorder, anarchy, military dictatorships, runaway inflation, transportation breakdowns and chaotic unrest will be the order of the day in many of the hungry nations."" This teaching had a dramatic effect on people's lives. In 1974 the Kingdom Ministry reported that the number of pioneers boomed, with people commended for selling homes to spend the short time left in God's Service. Likewise it was recommended to put off raising children. "Yes, since the summer of 1973 there have been new peaks in pioneers every month. Now there are 20,394 regular and special pioneers in the United States, an all-time peak. That is 5,190 more than there were in February 1973! A 34-percent increase! Does that not warm our hearts? Reports are heard of brothers selling their homes and property and planning to finish out the rest of their days in this old system in the pioneer service. Certainly this is a fine way to spend the short time remaining before the wicked world's end." Kingdom Ministry May 1974 p.3 How Are You Using Your Life? Witnesses stocked up on long life food, reminiscent of Mormon pantries. One of my friend's families hid items in the bush, including a cross bow so they could quietly hunt animals during Armageddon. Others went further; they cashed in superannuation plans, cancelled health insurance and sold their homes and bought caravans to live in. This created great problems for many families as they were totally unprepared for lives that would extend on for many decades. 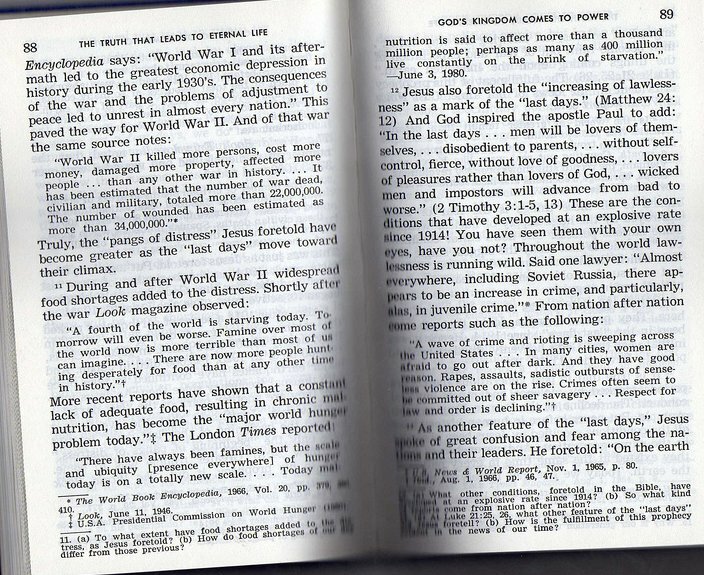 The 1968 edition of The Truth book contained subtle quotes pointing to the fact that the world could not survive past 1975. Likewise the 1968 edition contained a quote from the book Famine--1975! referring to how unlivable the world would be by 1975. The 1981 edition replaced this with a 1980 quote on famine from the London Times. "11 It may be that some who have been serving God have planned their lives according to a mistaken view of just what was to happen on a certain date or in a certain year. They may have, for this reason, put off or neglected things that they otherwise would have cared for. But they have missed the point of the Bible’s warnings concerning the end of this system of things, thinking that Bible chronology reveals the specific date. 12 What do Jesus’ own words show concerning the proper attitude as to the end—to look for a date, or what? He said: “Pay attention to yourselves that your hearts never become weighed down with overeating and heavy drinking and anxieties of life, and suddenly that day be instantly upon you as a snare. For it will come in upon all those dwelling upon the face of all the earth. Keep awake, then, all the time making supplication that you may succeed in escaping all these things that are destined to occur, and in standing before the Son of man.”—Luke 21:34-36. 15 But it is not advisable for us to set our sights on a certain date, neglecting everyday things we would ordinarily care for as Christians, such as things that we and our families really need. We may be forgetting that, when the “day” comes, it will not change the principle that Christians must at all times take care of all their responsibilities. If anyone has been disappointed through not following this line of thought, he should now concentrate on adjusting his viewpoint, seeing that it was not the word of God that failed or deceived him and brought disappointment, but that his own understanding was based on wrong premises. 16 However, say that you are one who counted heavily on a date, and, commendably, set your attention more strictly on the urgency of the times and the need of the people to hear. And say you now, temporarily, feel somewhat disappointed; are you really the loser? Are you really hurt? We believe you can say that you have gained and profited by taking this conscientious course. Also, you have been enabled to get a really mature, more reasonable viewpoint.—Eph. 5:1-17. 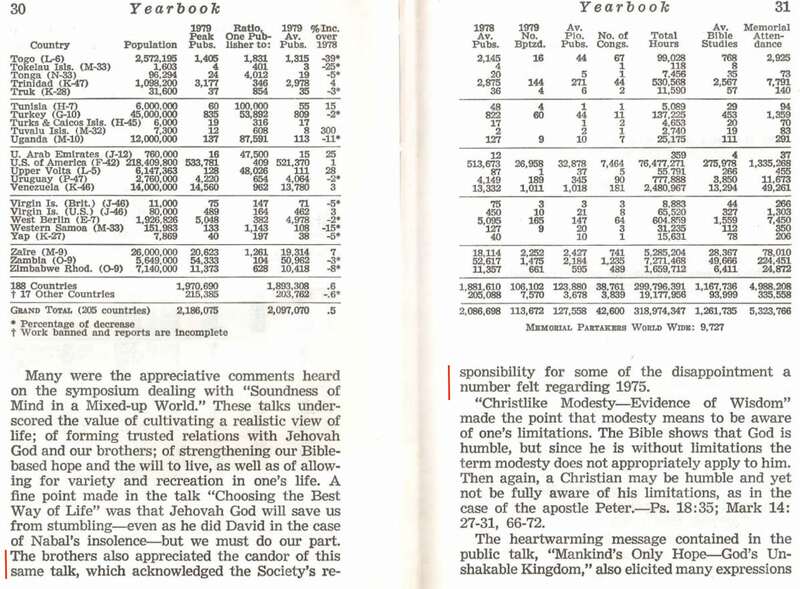 The first suggestion the Watchtower was compliant in the hype of 1975 was not until the 1980 Yearbook. "In modern times such eagerness, commendable in itself, has led to attempts at setting dates for the desired liberation from the suffering and troubles that are the lot of persons throughout the earth. With the appearance of the book Life Everlasting-in Freedom of the Sons of God, and its comments as to how appropriate it would be for the millennial reign of Christ to parallel the seventh millennium of man's existence, considerable expectation was aroused regarding the year 1975. There were statements made then, and thereafter, stressing that this was only a possibility. Unfortunately, however, along with such cautionary information, there were other statements published that implied that such realization of hopes by that year was more of a probability than a mere possibility . It is to be regretted that these latter statements apparently overshadowed the cautionary ones and contributed to a buildup of the expectation already initiated. In its issue of July 15, 1976, The Watchtower, commenting on the inadvisability of setting our sights on a certain date, stated: "If anyone has been disappointed through not following this line of thought, he should now concentrate on adjusting his viewpoint, seeing that it was not the word of God that failed or deceived him and brought disappointment, but that his own understanding was based on wrong premises." In saying "anyone," The Watchtower included all disappointed ones of Jehovah's Witnesses, hence including persons having to do with the publication of the information that contributed to the buildup of hopes centered on that date. Nevertheless, there is no reason for us to be shaken in faith in God's promises. Rather, as a consequence, we are all moved to make a closer examination of the Scriptures regarding this matter of a day of judgment. In doing so, we find that the important thing is not the date. What is important is our keeping ever in mind that there is such a day - and it is getting closer and it will require an accounting on the part of all of us. Peter said that Christians should rightly be "awaiting and keeping close in mind the presence of the day of Jehovah." (2 Pet. 3:12) It is not a certain date ahead; it is day-to-day living on the part of the Christian that is important. He must not live a single day without having in mind that he is under Jehovah's loving care and direction and must submit himself thereto, keeping also in mind that he must account for his acts." In its brief discussion of this event, Watchtower's history book Proclaimers makes subtle admission. Jehovah's Witnesses are forced to ignore intelligent lines of reason and follow whatever is promoted in the Watchtower. The excitement over 1975 is testament to how their thinking ability atrophies. There are at least three obvious reasons for why 1975 could not be the date for Armageddon. "The very fact that, as part of Jehovah's secret, no one today is able to find out how much time Adam and later Eve lived during the closing days of the sixth creative period, so no one can now determine when six thousand years of Jehovah's present rest day come to an end." During the 1975 hype it began being stated that Adam and Eve were created in the same year, speaking of "the year of Adam and Eve's creation in 4026 B.C.E." 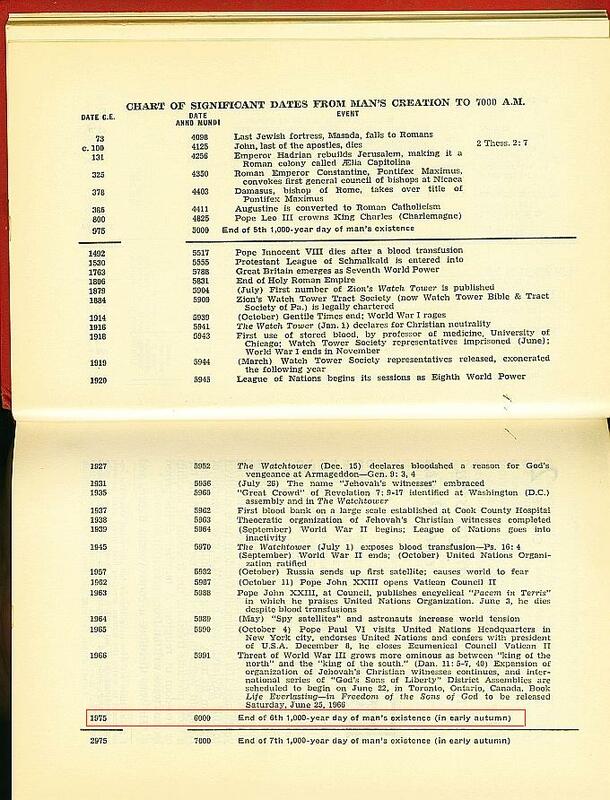 (Watchtower 1968 May 1 p.271) Immediately following the failure of 1975 the Watchtower reverted to their original position. The angels were observing as the day of creation ended and hence would know the day for the start of Armageddon if it was to be a simple 6000 year calculation yet the Bible states the angels did not know the time for the end. Matthew 24:36 "Concerning that day and hour nobody knows, neither the angels of the heavens nor the Son, but only the Father." The Bible does not specify the length of the creative days or the seventh day. It does not indicate that God's day of rest is 7,000 years, or that Jesus reign is to start after 6,000 years. The shallow reasoning the Watchtower had used to support its promotion of 1975 does not say much for the doctrinal integrity of the Governing Body. Acceptance of this doctrine also says wonders about the gullibility of the followers, indicating a lack of any deep desire to see truth beyond what appears written in the pages of the Watchtower. The failure of 1914 and 1925 taught the Watchtower the danger of specific date setting, but there can be no misunderstanding the implication of the articles prior to 1975. However, ask a Jehovah's Witnesses now whether 1975 was ever thought to be the end of the world and the answer will invariably be denial. This is in line with how the Watchtower paints this part of its history. Notice the brief discussion the Proclaimers book devotes to this important time of growth and the extent of an admission of error.